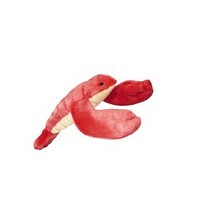 Fluff & Tuff Manny Lobster may look like a crust crustacean, but Manny's a lover, not a pincher. Your dog will love carrying Manny around by his long tail, and he's a great post-playtime pillow, claws and all. The Fluff & Tuff Manny Lobster has double-stitched reinforced seams, sewn eyes, durable mesh inner lining for the under amour and a non-toxic fibre stuffing for your dog's enjoyment.